I hope this finds you and the Tango’s Haus family doing well. Today, two years ago ( 25th feb. 2008), we got Jordan our red poodle from you. We got a cream colored poodle ( Petra) from a Sanderson, Texas rancher, six months after we got Jordan. As I have told you before, getting Jordan brought so much joy to my mother. 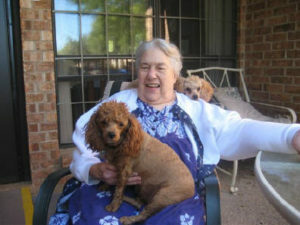 Mom passed away Feb. 6 of this year but the love, joy and companionship Jordan brought her was amazing. Jordan was her “guard” dog as you had to get approval from Jordan to visit mom. During her last days in the hospital the nurses allowed me to take Jordan to see mom. All the kissing and licking brought tears to the nurses eyes as well as mine. Mom was sooo happy and at peace because she had her puppy visit her. This is a huge thank you to you for breeding the type of puppy that can bring the love and joy Jordan has to my family. I have included a picture of mom and her two puppies in this e mail. Jordan was moms companion even though Jordan lived with us . We had a lady live with mom for 3 years until this past may and then we had mom move in with us . That put Jordan with her 24/7 which she loved. Losing mom has been hard on us but really hard on Jordan. Mom lived a good life of over 94 years but I dare say having Jordan made it better for her. The two hospital visits Jordan had with mom just 2 days before she passed away was a real tear jerker for all that were there to see it.